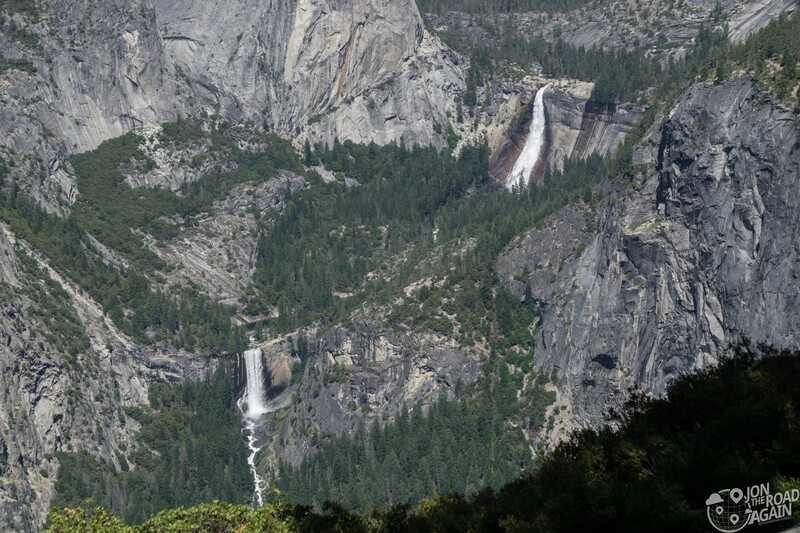 Mist Trail is one of the most popular trails in Yosemite, and that is for very good reason. 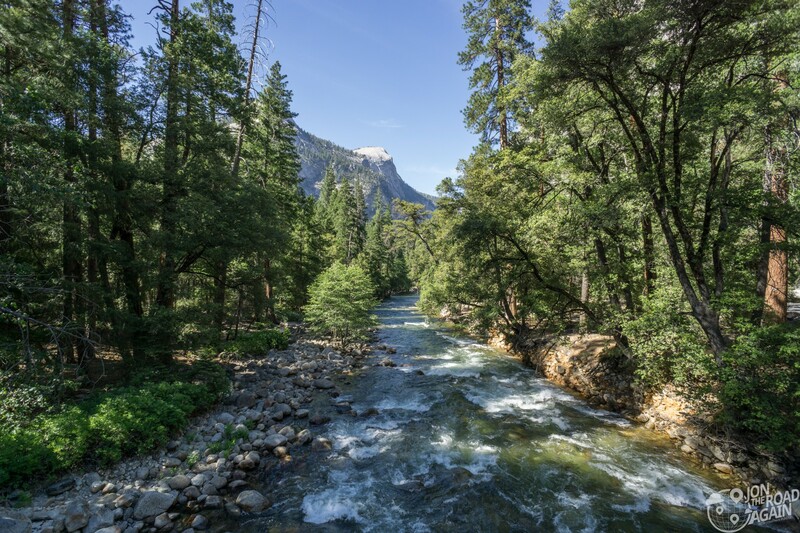 The two waterfalls you will encounter are breathtaking, the hike is close to Yosemite Valley, and it connects to the Half Dome trail and Cloud’s Rest trails. 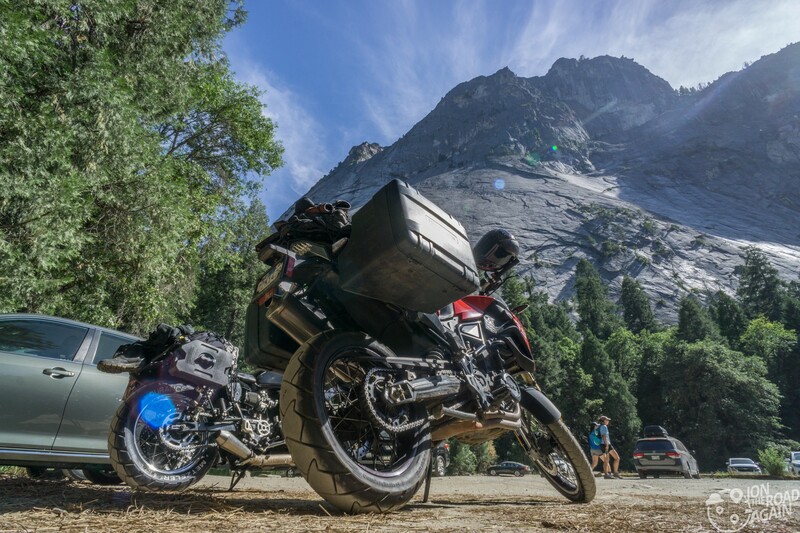 It also connects to the John Muir Trail which starts here in Yosemite and ends 215 miles later at the top of Mount Whitney. 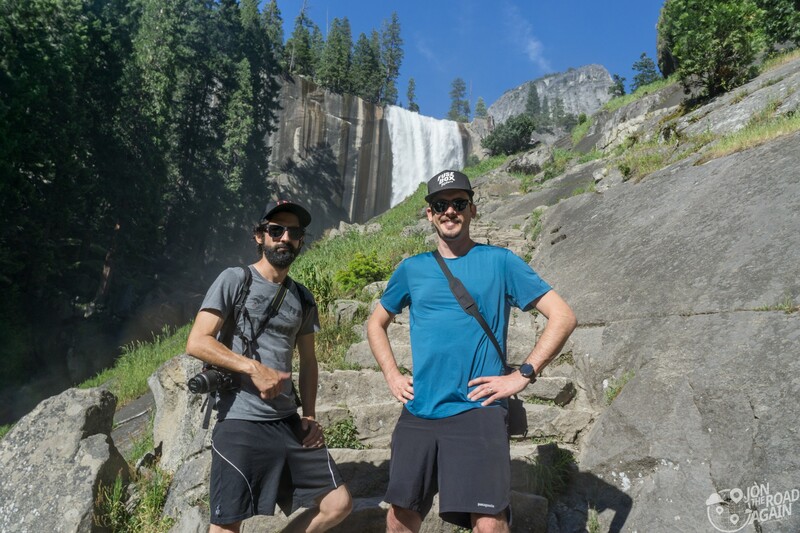 We’re just hiking to the first waterfall, Vernal Fall on this adventure, our first in Yosemite. We’ve parked the bikes at the “Yosemite Valley Trailhead Parking,” which was as close as we could figure we were allowed to park. It’s still a decent little walk to get to the trail (about a mile on a paved path). Way up on top of that cliff in the background of the photo below is Glacier Point, one of the finest views in all of the National Park system. The trail starts just after crossing the Happy Isles Bridge. The bridge crosses the Merced River, which is one of two rivers that start in the park; the other is the Tuolumne River. 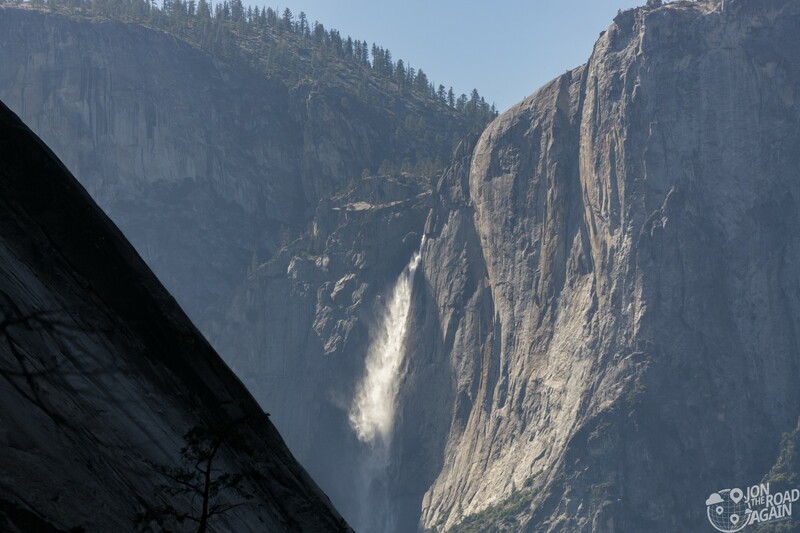 Whenever flooding periodically ravages Yosemite Valley, it is at the hands of the Merced. 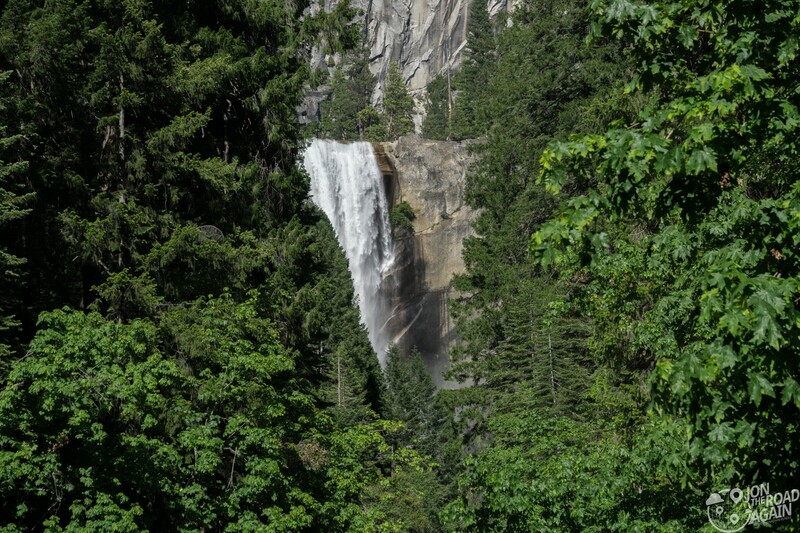 Moving on, after a bit of elevation gain, a partially obstructed view of Upper Yosemite Fall awaits you about .25 miles into the trail. The trail continues along the Merced, which is mostly hidden by trees. The surrounding rock faces are dramatic. At this point, if the crowds keep you from feeling secluded the air traffic overhead doesn’t help either. But this is the wrong trail for seclusion. You will see quite a few of these little guys. 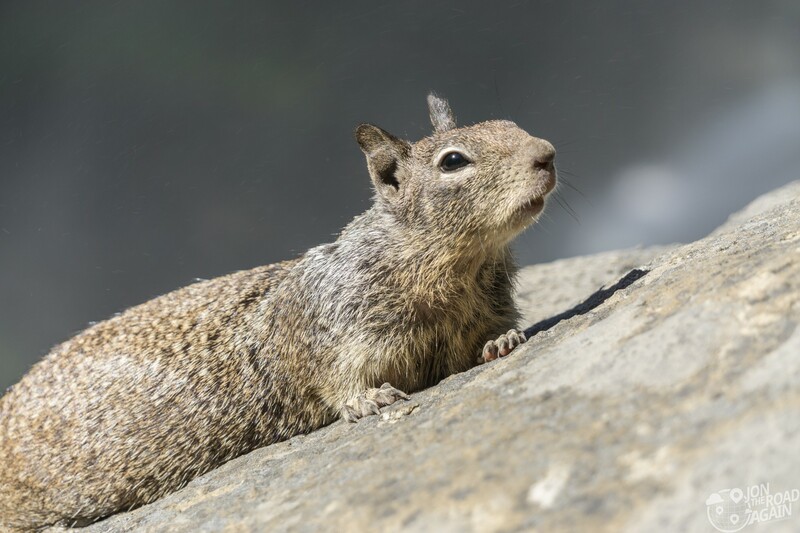 The California ground squirrel. I think they’re pretty adept at sneaking off with some granola bars from hikers taking a break nearby. This one has a guilty face. Speaking of people, do you want to take a selfie with a waterfall in the background? Good luck with that! After standing around patiently waiting for a clear shot, we gave up and just took one with everyone else included. Zooming in from the bridge, we get a peek-a-boo view of Vernal Fall. We’re making our way there next. About a mile later, we get a closer look at this majestic waterfall. The final push to the full view is made by way of steps carved into the hillside (or cliff face depending on how dramatic you want to be). Wow, the views continue. We sat here for a good 10 minutes just enjoying the light waterfall spray on a hot day. 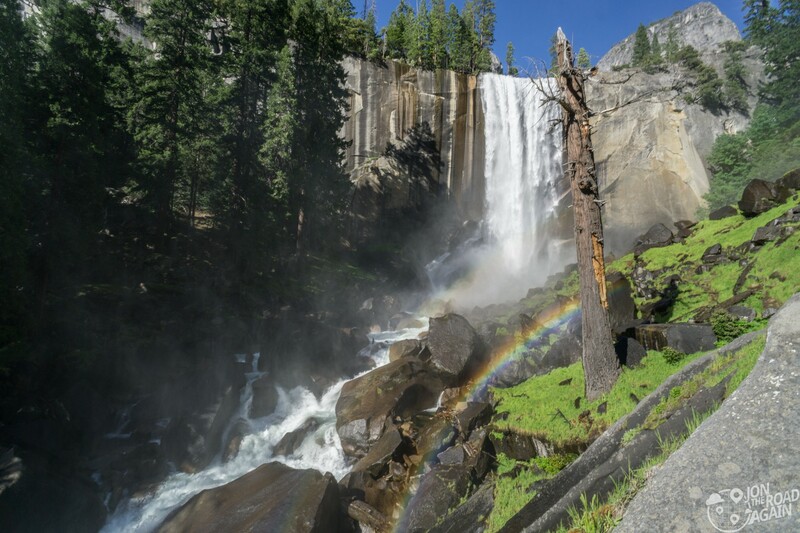 Vernal Fall is an impressive sight. That’s a raging curtain of water plunging 317 feet. Did I mention Mist Trail is very wet? 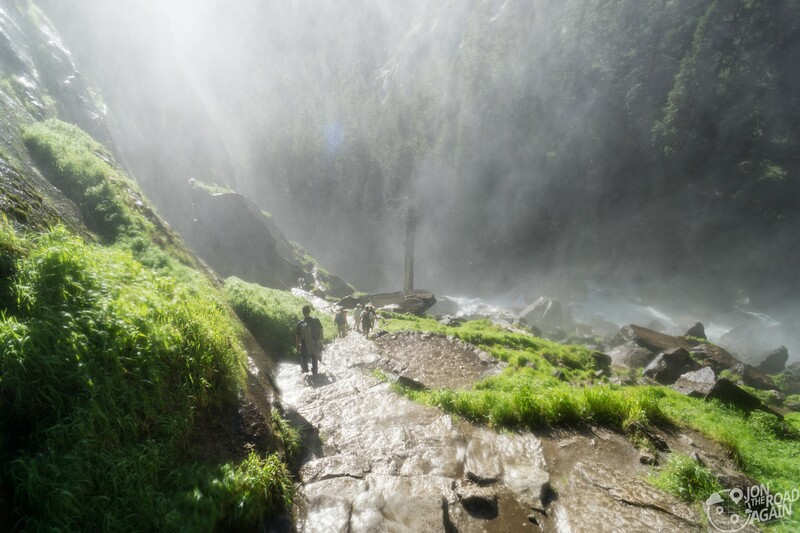 Once you hike a little closer to the falls, you can expect to be drenched. As you gain a little elevation the mist subsides. 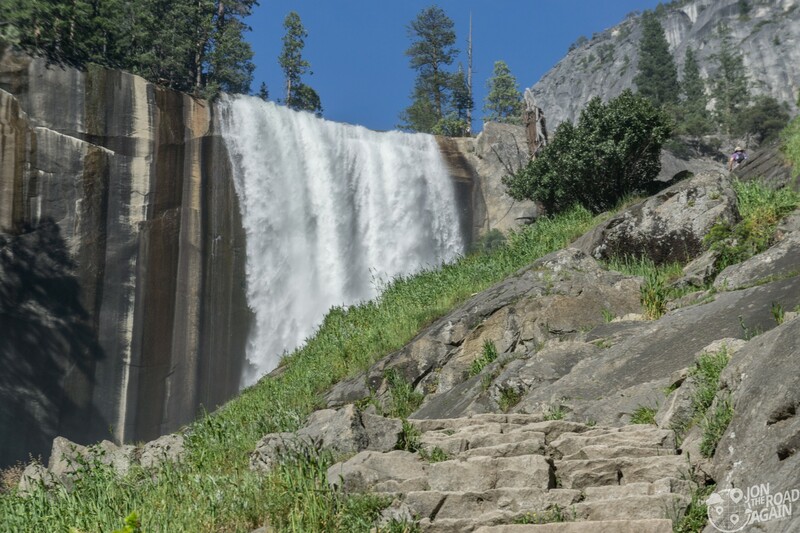 Here at Vernal Fall you can keep hiking up the slippery slopes to the very top of the fall. There is an overlook there. 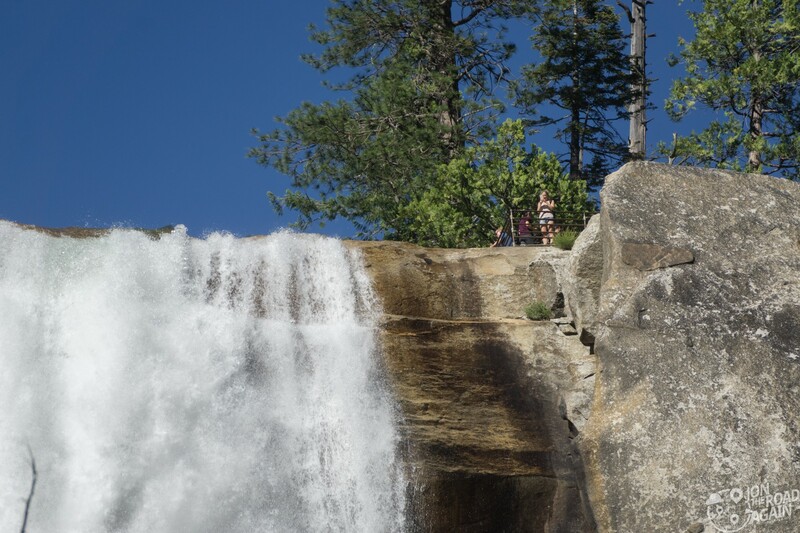 After Vernal Fall, you can continue to the larger Nevada Fall another 2 miles from here. We’re tired, so we’re skipping it. 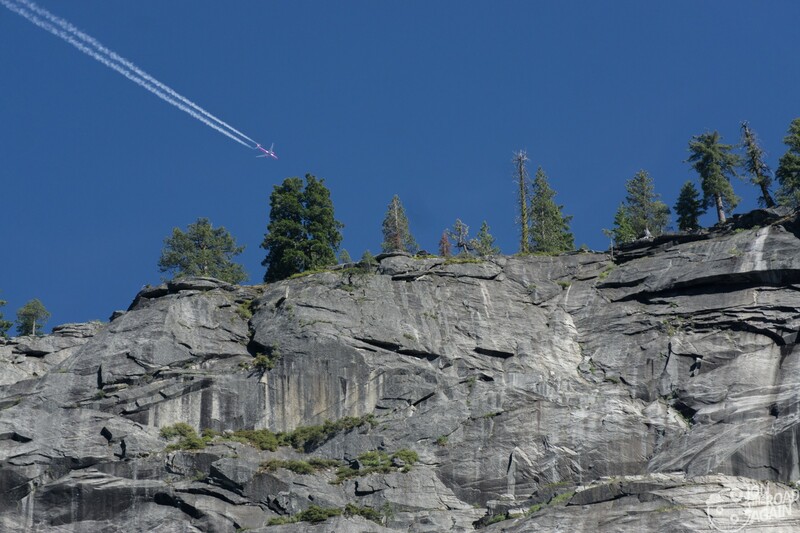 At Washburn and Glacier Points, it seems like you can see almost all of Yosemite; Mist Trail included. 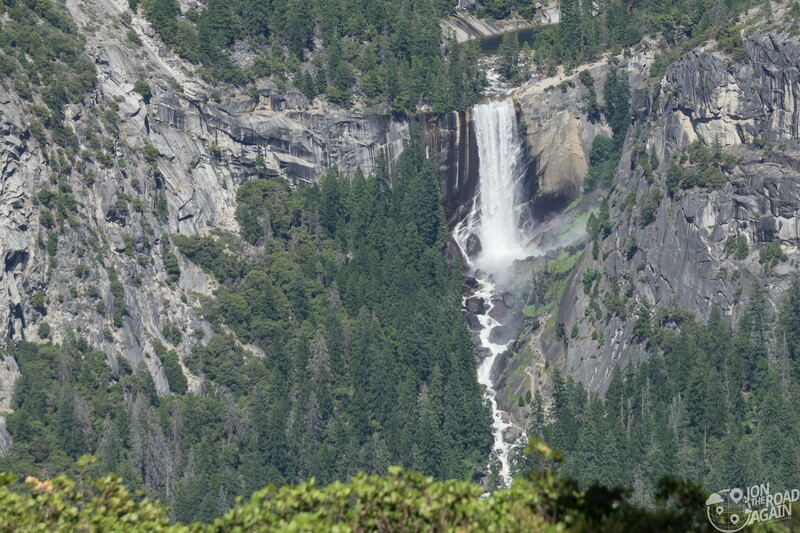 From these incredible vantage points, you can see Vernal Fall and the larger Nevada Fall further up the Mist Trail. 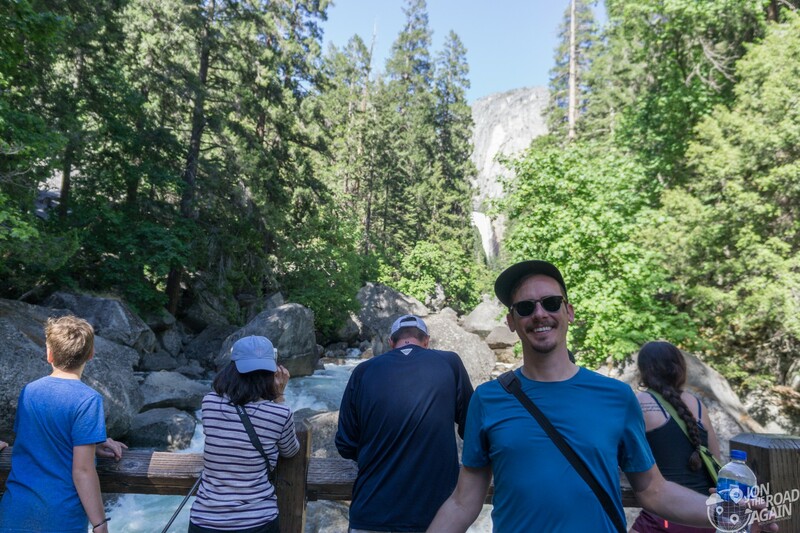 Mist Trail is one of the most popular trails in Yosemite, which means it will probably be pretty crowded. We hiked at the end of the day on a Friday and I didn’t find it to be too bad. 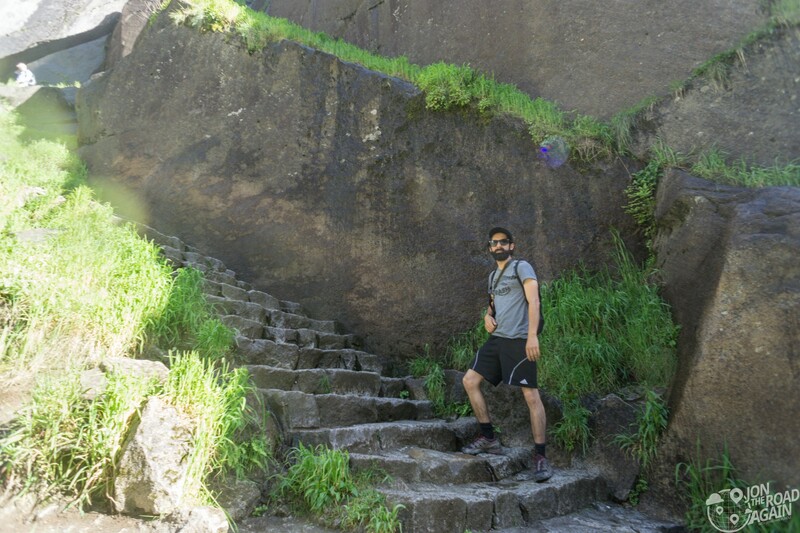 Even though the trail isn’t that long or strenuous, the crowd thinned out considerably once you pushed to the falls. 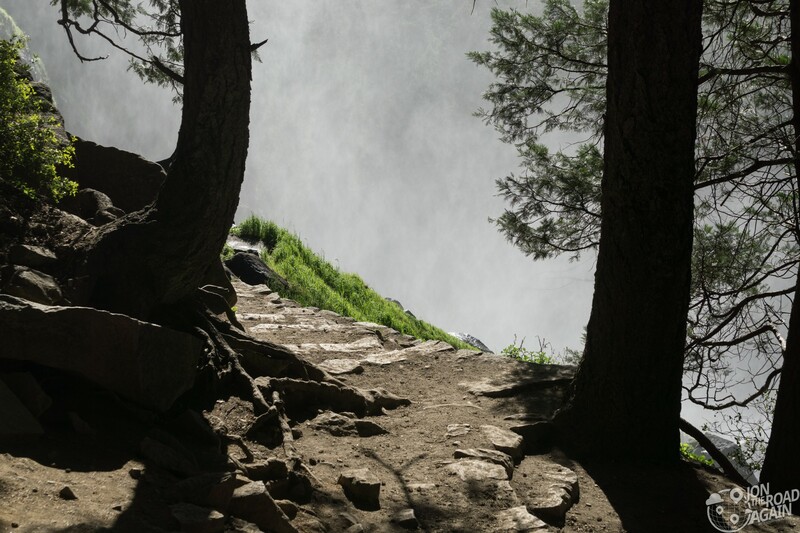 Watch your step and stay away from the water – Mist Trail is the deadliest in Yosemite. Most deaths occur because a hiker slipped into the river.